Home Featured Politics RECONSTRUCTION WORKS ON THE CONFLUENCE BEACH HOTEL LOKOJA SET TO COMMENCE -Says Kogi State Government. RECONSTRUCTION WORKS ON THE CONFLUENCE BEACH HOTEL LOKOJA SET TO COMMENCE -Says Kogi State Government. 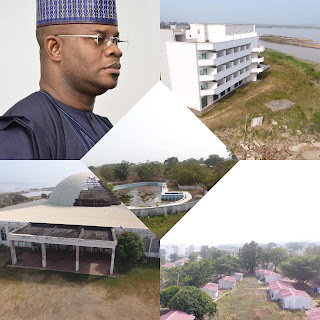 Kogi State government has finalized agreement with one of the leading tourism industries in the world; Capital Boutique Limited to begin the remodeling and reconstruction of the moribund Confluence Beach Hotel, Lokoja. The state governor, Alhaji Yahaya Bello signed the multi billion Naira deal with the company Tuesday last week in his office at the Lugard House, Lokoja. To improve economic fortune of the state, the Kogi State Economic Management Team said the deal included expansion and remodeling of the hotel which is geared towards job creation and recreation activities. The confluence Beach Hotels will be transformed into a 5-Star hotels with standard Golf Course and different resorts. The Managing Director of Capital Boutique Limited, Mr Cyril Akika, said the development of the Confluence Beach Facility is to include a Nine (9) Hole Golf Course, Blocks of 108 rooms, 158 chalets, an International Conference Centre, Swimming pools and shopping areas in addition to the exist facilities and further stated that a total Capital in excess of 5billion Naira will be injected into the first phase of the project. The State Auditor General, Alhaji Yakubu Okala who spoke on behalf of the State Economic Management Team disclosed that the 25 year leasehold agreement will be jointly managed by a Special Purpose Vehicle (SPV) Company to be composed of representatives of the State and the Core Investors. Okala said that the investment is capable of generating about 2000 jobs for the people of Kogi State which will restore the Tourism potential of the State to the good old days and improvement in the Internally Generated Revenue. The project; reconstruction of the hotel, Golf Course and other facilities is expected to be completed in 18 months.